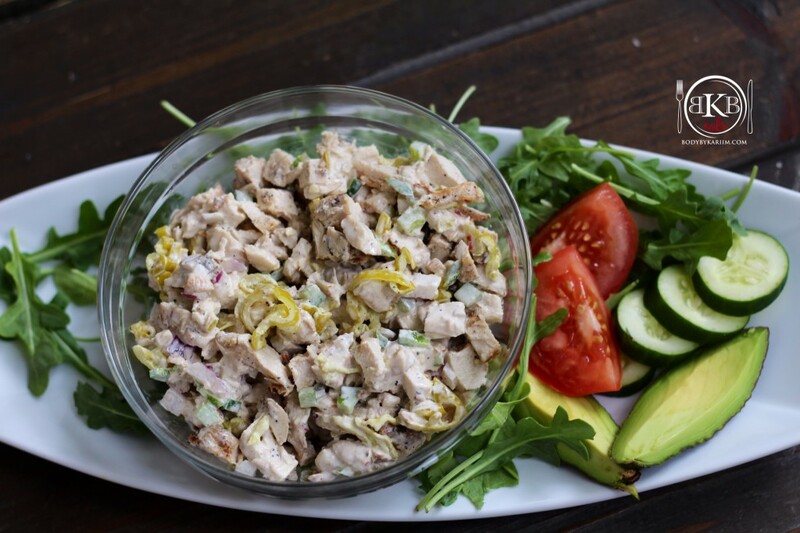 Our delicious protein packed chicken salad recipe is a great lunch, dinner or snack option. With such a busy schedule, this chicken salad recipe really helps because it can be made and stored in the refrigerator for several days. Add to the top of sliced cucumbers or make a sandwich using a healthy wrap or low-calorie Ezekiel bread & Enjoy! Clean chicken breast and slice in half the long way. Pat dry with paper towel to remove excess water & set aside. Wish together in a bowl: olive oil, sea salt, ground pepper, fresh garlic, and lemon to taste. Place chicken breast in that bowl. Cover and refrigerate-allow chicken to marinate for 2 hours. After 2 hours, Take chicken out and remove excess marinade. Let chicken sit until it’s room temperature. Turn grill pan on medium high heat. Place chicken on pan for 8-10 minutes each side (depending on thickness). Cook until done. Remove chicken breast from pan and place on cutting board allow to cool. Once cooled, chop chicken breast into small pieces and place in bowl. Finely chop ½ of red onion, ½ bell pepper, and 1 cup of pepperoncini. Place in the bowl with chicken breast. 10 . Take 1 spoon full of mayonnaise or Greek yogurt and put in bowl with other ingredients. Mix all ingredients together. Can be served right away or enjoyed later. Be sure to check out our Cooking Demo.